Vivid, surprising, and utterly timely, Akiko Busch's How to Disappear explores the idea of invisibility in nature, art, and science, in search of a more joyful and peaceful way of living in today's increasingly surveilled and publicity-obsessed world. In our increasingly networked and image-saturated lives, the notion of disappearing has never been both more enchanting and yet fanciful. Today, we are relentlessly encouraged, even conditioned, to reveal, share, and self-promote. The pressure to be public comes not just from our peers, but vast and pervasive technology companies, which want to profit from patterns in our behavior. A lifelong student and observer of the natural world, Busch sets out to explore her own uneasiness with this arrangement, and what she senses is a widespread desire for a less scrutinized way of life-for invisibility. Writing in rich painterly detail about her own life, her family, and some of the world's most exotic and remote places-from the Cayman Islands to Iceland-she savors the pleasures of being unseen. Discovering and dramatizing a wonderful range of ways of disappearing, from virtual reality goggles that trick the wearer into believing her body has disappeared and to the way Virginia Woolf's fictional Mrs. Dalloway feels a flickering of personhood as an older woman, Busch deliberates on subjects new and old with equal sensitivity and incisiveness. A unique and exhilarating accomplishment, How to disappear is a shimmering collage of poetry, cinema, memoir, myth, and much more, which overturns the dangerous modern assumption that somehow fame and visibility equate to success and happiness. 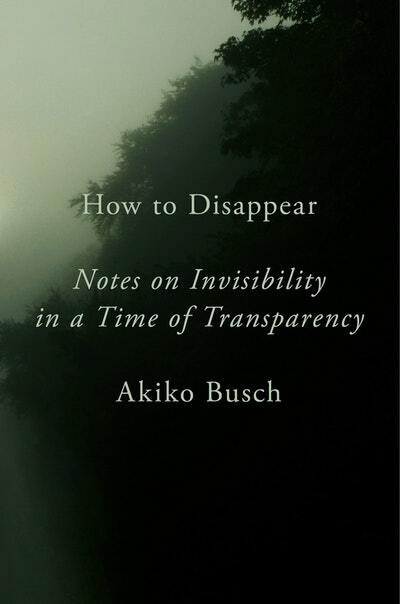 Busch presents a field guide to invisibility, reacquainting us with the merits of the inconspicuousness, and finds genuine alternatives to the typical life of perpetual exposure. Accessing timeless truths in order to speak to our most urgent contemporary problems, she inspires us to develop a deeper appreciation for personal privacy in a vast and invasive world. Love How To Disappear? Subscribe to Read More to find out about similar books.